Practice Electronic Devices and Circuits questions and answers for interviews, campus placements, online tests, aptitude tests, quizzes and competitive exams. This set of Electronic Devices and Circuits Multiple Choice Questions & Answers (MCQs) focuses on “Zener Diode”. Explanation: Zener diodes are used as voltage regulators but they aren’t called voltage regulators. They are called breakdown diodes since they operate in breakdown region. 2. Which of the following is true about the resistance of a Zener diode? Explanation: All of the statements are true for the resistance of the zener diode. 3. Which of the following is true about the temperature coefficient or TC of the Zener diode? Explanation: All of the mentioned are true for the TC of a zener diode. 4. Which of the following can be used in series with a Zener diode so that combination has almost zero temperature coefficient? Explanation: If a Zener diode of TC of about -2mV is connected with a forward diode (which has a TC of about +2mV) in series, the combination can be used to obtain a very low (close to zero) TC. Explanation: Note that the curve is v-I curve and not an i-v curve. Explanation: ICs have been widely adapted by the industries over conventional zener diodes as their better replacements for a voltage regulators. 7. A 9.1-V zener diode exhibits its nominal voltage at a test current of 28 mA. At this current the incremental resistance is specified as 5 Ω. Find VZ0 of the Zener model. VZ = VZo + 5IZ = 8.96 * 5IZ. 8. A shunt regulator utilizing a zener diode with an incremental resistance of 5 Ω is fed through an 82-Ω resistor. If the raw supply changes by 1.0 V, what is the corresponding change in the regulated output voltage? 9. A designer requires a shunt regulator of approximately 20 V. Two kinds of Zener diodes are available: 6.8-V devices with rz of 10 Ω and 5.1-V devices with rz of 30 Ω. For the two major choices possible, find the load regulation. 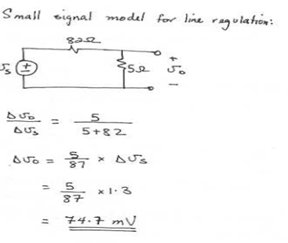 In this calculation neglect the effect of the regulator resistance R.
For 5.1 Zeners we need 4 diodes to provide 20.4v with 4 * 30 =120Ω Resistance. load Regulation = -120mV/mA . 10. Partial specifications of a Zener diode is provided. VZ = 10.0 V, VZK = 9.6 V, and IZT = 50 mA. 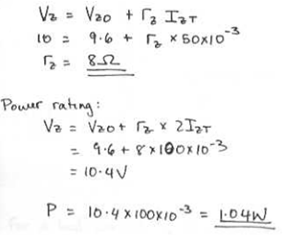 Assuming that the power rating of a breakdown diode is established at about twice the specified Zener current (IZT), what is the power rating of each of the diodes described above? Sanfoundry Global Education & Learning Series – Electronic Devices and Circuits. 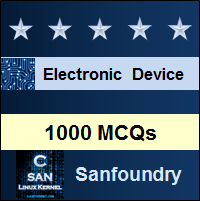 To practice all areas of Electronic Devices and Circuits, here is complete set of 1000+ Multiple Choice Questions and Answers.